This is a game from Lucas Pope due for release this summer. It's still in Beta, but allready a very nice gaming experience. In the game it's your job to make sure no one with the wrong documentation crosses the border. You will hade to deal with terrorists and spies hidden among normal visitors and immigrants. The state will pay you your salary if you do your job according to the strict regulations and rules. If you make misstakes they will fine you, and if you really bad at your job they will throw you in jail. Very enjoyable to play with interesting and challenging game mechanics. There is also an interesting political side to the game, and some moral issues to consider. Looking forward to play the whole game soon. Meanwhile you can check out the Beta at http://dukope.com/. WWE 13 - Is it a bug or a game? I really wanted to like this game. I'm mad about wrestling and fell in love with the WWE 12 edition, wich I thought was really cool and a big leap forward in the game experience of WWE-games. The idea to focus on the 90's attitude era in the game was very promising, and the roster of the game was really interesting. Sadly this game is full of bugs and poor execution that really impairs the game experience. Characters float in mid air and limbs sometimes twists in impossible positions. The game also freezes alot and sound is sometimes broken. It also had alot of promises of interesting plots in Universe mood that also seems to be broken and simply doesent work. The explanation is probably that the develepors, THQ had financial problems and soon after the release of the game went bankrupt. Sadly this probably means that the multitude of bugs will never be fixed and the game is simply not worth investing either time on money in. Got the urge to play something with racing on the PS3. Found this game called Dirt Showdown at the game store. The game is developed by Codemasters and a part of the Colin McRae Rally games series. The really fun part of this game is full contact racing and demolition derbys. There is also a part of the game where you have to use more advanced driving skills and perform tricks and preciscion driving. The last part is harder to get into and I wish I had a PS3 sterring wheel. It seems rather hard to master the tricks on the basic controls. There is also possibilities to play against other players online and you can also play in multiplayer mode. It's easy to get into the game and as you progress you unlock new races and tracks. If you win you get prize money that you can spend on new cars or upgrades. This is just disturbingly good, weird and brilliant. Had my first encounter with the sport Roller Derby this weekend. Roller Derby is an all female, full contact sport on roller skates. It has been around since 1922 and originated in the USA. Roller derby is played by two teams of five members simultaneously skating on a circuit track. One in each team is called a jammer, wich is the player that are able to score for the team (recognisible by the star on the helmet). The other four members are called blockers. The game is played during two periods of 30 minutes. Point scoring occurs during jams (plays that last up to two minutes). During a jam, points are scored when a jammer in scoring position laps members of the opposing team. Each team's blockers use body contact, changing positions, and other tactics to assist its jammer to score while hindering the opposing team's jammer. Certain types of blocks and other play are violations; referees call penalties and require violators to serve time in a penalty box. Well, thats the basics of the game and initially it's very confusing. It's alot happening during a jam and it took me awhile to figure out what to focus on. But after a couple of jams I started to figure out what was happening and the game became much more interesting to watch. The bout that I saw was a game with the local team Gothenburg Roller Derby vs a danish team called Victorious Valkyries. The danish grirls took an early lead and for a short while it looked like they would destroy the local girls. But as the game progressed the Gothenburg girls started to score and before the first half was at an end the Gothenburg team had managed to pass the danish team and was in the lead. In the end the two team had almost the same score and the game was settled in the final jam. The Gothenburg team finally won the game with the score 147 - 140. Cool with such an exiting game at my first time at a bout. I was totally impressed by the Gothenburg jammer Mad Fish. She scored most points for Gothenburg and was a very forceful skater. See Mad Fish score for Gothenburg in the game. The genre space disco brings many cheezy moments. This is a wonderful example featuring early work from Sara Brightman, mostly known for her work in productions by Andrew Lloyd Webber. This is for all you sci-fi nerds out ther. I have been looking for this for several years. I first saw it on swedish televison in the late 70's and it had a great impact on me as a child. I have always been fascinated by sci-fi and space, but it was something about this Norwegian tv-production that struck a chord in me. Maybee beacuse it seemed closer and more real when the actors spoke norwegian (wich is really close to swedish). Blindpassasjer is about the crew on the starship Marco Polo returning from a mission to the planet Rossum. When awoken from deep sleep the crew discovers that an alien has slipped onboard to kill and replace one of the crew members. The question is who? Sadly this DVD is not subtitled. really strange since I think this would really appeal to an audience outside Norway and Scandinavia too. 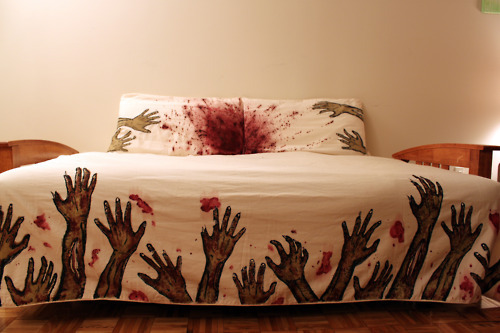 This is really cool bed sheets by Melissa Christie. Check out her blog at Tumblr. _I love Star Wars, but I have never gotten around to play any games based on the Star Wars universe. Now I am. In december they launched the MMORPG, Star Wars: The Old Republic, and I'm hooked. SW:TOR takes place 3500 years prior to the movies. It's a conflict between the Galactic republic and the Sith Empire and you have to chooose what side you're on. Then you have to choose between four races and four classes, pick a name and enter the Star Wars universe. __I have chosen to play for Dark side and have so far tried out Bounty Hunter and Imperial Agent. Both are very interesting and fun to play. The controls and fighting mechanisms is very similar to World of Warcraft. What is unique for this game is the storylines. It feels like the developers really have gone the extra mile to provide for interesting plots. And all the missions start with fully animated conversations that give alot to the feeling of the game. And then you will get your own spaceship, and you will own a robot, and there is space fights, light sabers, cool gadgets and plenty of aliens. You will probably waste alot of time on this, but you will at least have alot of fun while wasting. I just read this cool book called Convergence Culture: Where old and new media collide by Henry Jenkins. It may sound boring and academic, but all the examples are taken from culture that are affecting our lifes and changing how people interact with media. Henry uses exaples like American Idol, The Matrix, Harry Potter, Star Wars and other media phenomenons that we are familiar with. This book is a good way to understand the development of modern media. It is also hopeful in it's visions. Even if media is getting more accesible through internet, there will be oppurtunities to make money from art, movies, video games e.t.c. in the future. At the same time the consumer will be able to take a more active part in controlling and affecting it's content. All those nutty interests, ununnecessary things and funny trivia.